H.S.H. 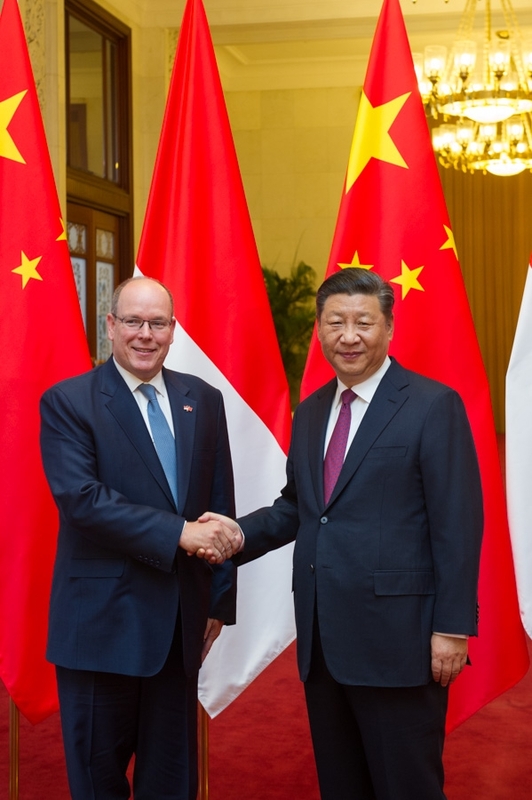 Prince Albert II undertook, from 5 to 8 September 2018, a State Visit to China to discuss the themes of Environmental Protection, the Economy and Culture. Wednesday 5 September: the Sovereign Prince was in Jilin Province, north-eastern China, in the context of initiatives by the Prince Albert II Foundation (FPA2) in collaboration with the Chinese branch of the World Wildlife Fund (WWF); both strive to ensure protection of Amur tigers. The Amur River is Siberia’s longest river, forming China’s border with Russia. Thursday 6 September, in Beijing, H.S.H. the Prince was greeted by Luo Shugang, Minister of Culture and Tourism for the People’s Republic of China, and Shan Jixiang, Director of the Forbidden City, where He inaugurated the exhibition "Princes and Princesses of Monaco - A European Dynasty (13th-21st centuries)" held in the Forbidden City until 11 November 2018, in two pavilions at the Meridian Gate. The Prince was then guided by Thomas Fouilleron, Curator of the exhibition and Director of the Monaco Palace Archives and Library. The exhibition was organised and prepared by the Grimaldi Forum Department of Cultural Events and staff from the Palace of Monaco, with assistance from journalist and television host Stéphane Bern as artistic advisor. On a 1,400m² surface area, this chronological journey through seven centuries of history, the scenography of the exhibition is structured around four main themes: Construction of the territory and advent of the monarchy (13th-17th centuries); A small sovereignty peripheral to France (17th-18th centuries); Invention of Monte Carlo — Birth of a new town (19th-20th centuries); Global renown (20th-21st centuries). It features prestige works, some rarely or never before displayed, most from the collections of the Palace of Monaco, as well as the Oceanographic Museum, NMNM (New National Museum of Monaco) and Cathedral as well as private collections: tapestries, altarpiece, marquetry furniture, painted portraits, sculptures, precious books, archives, silverware, jewellery, painting by great masters (Monet, Renoir, Cézanne, etc. ), personal objects belonging to the Princes, garments and uniforms. Two exceptional items add special dazzle to the scenography: the Empire-style Princes’ throne; the processional dais of gold and silver-embroidered velvet bearing Prince Antoine I and his wife Marie de Lorraine’s coat of arms, dating from 1712, which has served in all sacred and princely ceremonies from the 18th top the early 19th centuries, specially restored for the occasion. Friday 7 September: H.S.H. the Prince and His delegation were greeted by Xi Jinping, President of the People’s Republic of China, in the Great Hall of the People. 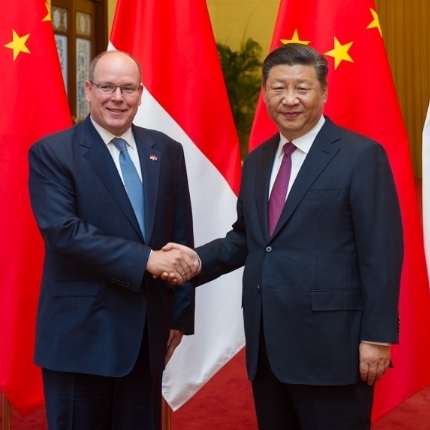 After reviewing a detachment from all three armies (ground force, air force and navy) including female personnel, the Sovereign Prince was received in audience by President Xi. During this meeting, in which environmental issues were raised in particular, President Xi expressed his gratitude to the Sovereign Prince for His support in protection of Siberian (or Amur) tigers. This meeting was followed by an official lunch, after the Prince and His Delegation went to Tiananmen Square to lay a wreath at the foot of the Monument to the People’s Heroes. The Sovereign Prince then visited the Chinese Ministry of Ecology and the Environment, actively engaged, with the Prince Albert II Foundation, in the fight against cyanobacteria (blue-green algae) in the waters of Taihu Lake, China’s third largest freshwater lake. Later in the afternoon, H.S.H. the Prince went to Huawei headquarters for the signature of the "Nation 5G" contract between Monaco Telecom and Huawei, enabling the Principality to take advantage of this new ultra-fast standard and become the world’s first country to use it (coverage scheduled in the course of 2019). At the end of the day, Prince Albert went to the "BRICKLIVE Animal Paradise show" at the ‘Birds Nest’ Olympic Stadium in Beijing. This exhibition focuses on endangered species under threat of extinction in their natural habitats with full-scale reproductions by Lego to demonstrate the need to protect biodiversity and the environment. The exhibition will open in Beijing before travelling to twenty other Chinese cities and will contribute financially to the Prince Albert II Foundation by donating part of its revenue from ticket sales. In December 2018, certain monumental animal models will be displayed in Monaco, for the "BRICKLIVE Christmas Show" at the Grimaldi Forum. Saturday 8 September, last day of this State Visit, the Sovereign visited Zhoukoudian Cave, just an hour’s drive from Beijing, where archaeological excavations are underway in collaboration with the Institute of Human Palaeontology. This prehistoric site comprises several caves where fossil remains of Homo erectus and Homo sapiens were discovered attesting to human presence in China over 400,000 years ago.